Amazon.com: Modality, Morality and Belief: Essays in Honor of Ruth Barcan Marcus (9780521100571): Walter Sinnott-Armstrong, Diana Raffman, Nicholas Asher: Books. Modality, morality, and belief : essays in honor of Ruth Barcan Marcus. Responsibility: edited by Walter Sinnott-Armstrong in collaboration with Diana Raffman, Nicholas Asher. Imprint: Cambridge [England] ; New York : Cambridge University Press, 1995. Physical description: xi, 270 p. : ill. ; 24 cm. 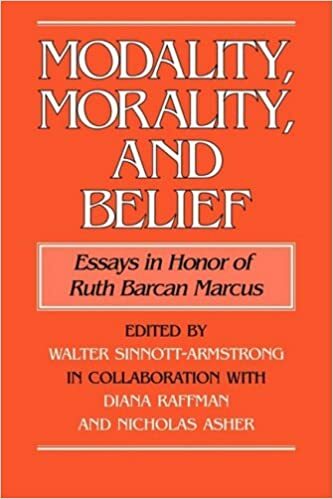 Buy Modality, Morality and Belief: Essays in Honor of Ruth Barcan Marcus by Walter Sinnott-Armstrong, Diana Raffman, Nicholas Asher (ISBN: 9780521440820) from Amazon's Book Store. Everyday low prices and free delivery on eligible orders. Modality, Morality and Belief Essays in Honor of Ruth Barcan Marcus. Book (Edited Book). This collection of original essays honours one of the most influential philosophical pioneers of the twentieth century, Ruth Barcan Marcus.